Two Boneheads Video Series: The MCL Sprain - Jeffrey H. Berg, M.D. Ligaments are thick bands of tissue that connect and stabilize two or more bones. The MCL (Medial Collateral Ligament) is one of the four main knee ligaments. The other main ligaments are the LCL (Lateral Collateral Ligament), ACL (Anterior Cruciate Ligament) and the PCL (Posterior Cruciate Ligament). The MCL and the LCL are the two collateral ligaments. The collateral ligaments are on the sides of your knee, whereas the cruciate ligaments are in the center of your knee. The MCL is on the inside of your knee, on the side adjacent to your other knee, and the LCL is on the outside of your knee. Your collateral ligaments help stabilize the two main bones of your knee, your lower thighbone (femur) and your upper shin bone (tibia). They primarily protect the knee against bending too far inward (MCL) or outward (LCL). Sprains are just over-stretching or tearing of a ligament. MCL sprains are no different. They typically occur when the knee is excessively bent in towards the opposite knee. Less often, they can result from a twisting injury. Frequently, an MCL sprain occurs alone. Sometimes an MCL sprain will exist along with injuries to additional ligaments or other structures of the knee, such as the menisci, cartilage surface or even the bones themselves. The most common way an MCL sprain occurs is when the knee sustains a force on the outside of the knee directed in toward the opposite knee. This frequently happens when someone falls onto the outside of the injured’s knee. The most common and the first MCL sprain symptom that you will have is acute pain on the inside of your knee. Often this is associated with a noticeable “pop” in the same location. Frequently immediately following the injury, walking regularly, or at all, is very difficult. Almost always, the pain is to such a degree that continuing to participate in the activity you were injured in is not possible. In more severe sprains, there can be a “looseness” to your knee. Your knee may bend excessively outwards, particularly when putting your weight on your injured leg. Over time your knee is likely to stiffen some. To what degree is determined by the injury severity. Swelling inside your knee is rare with an isolated MCL sprain. However, if you have also sustained another ligament injury, a meniscal tear, a bone bruise or a broken bone as well, swelling inside your knee will often be present. There are primarily four kinds of MCL sprains. Three are almost always treated non-surgically and the other, which is relatively rare, may require surgery. The proper treatment for your MCL sprain depends on the type of sprain you sustained. 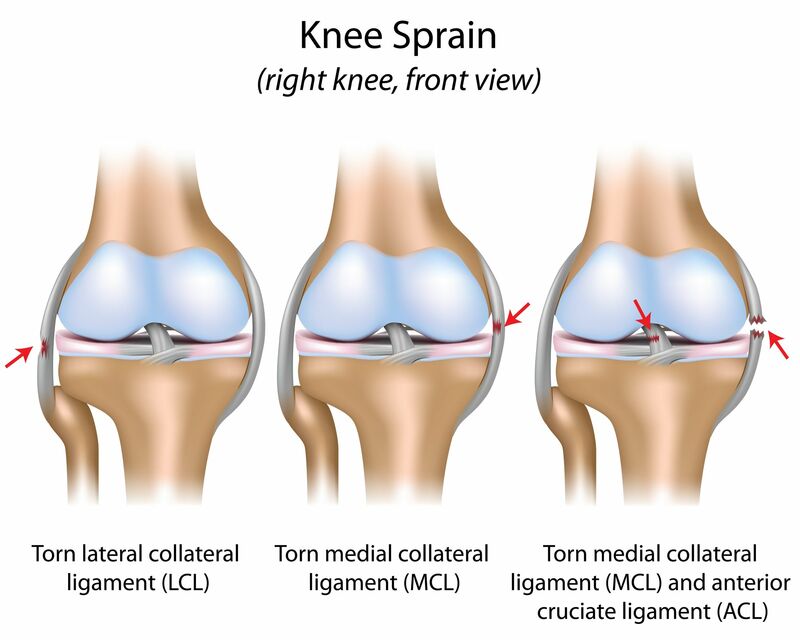 MCL sprains of the first three types (Grade I, II, III sprains) rarely ever require surgery to the MCL because the ligament will usually heal on its own. The fourth type of injury is a rare variant in which the MCL may get flipped into the joint or out of position, preventing it from healing. These injuries may require a repair of your MCL. Most MCL sprains can be treated symptomatically because they are often fortunately not too severe. Initially, the treatment consists of ice to reduce pain and swelling, over the counter pain medications as needed and relative rest, avoiding painful activities as much as possible. If the MCL sprain occurs along with a knee dislocation or a fracture, more urgent evaluation and care are needed. These sprains are injuries to the ligament without any ligament stretching or lengthening. By definition, there is no knee instability with this degree of damage. As a result, bracing is not required. Bracing, however, may help with the pain. Your symptoms will determine the permitted activity level. Therefore, people tend to recover more quickly after this level of injury. It is possible for a young person with an isolated Grade I MCL sprain to be back to full activities within 3-6 weeks. Usually, in preparation for your return, formal physical therapy is advised. Some ligament stretching and lengthening occurs with this degree of injury. As a result, there is some knee instability. On exam and while walking, your knee will “open up” some. These injuries usually benefit from bracing that provides stability to the knee. Bracing enables easier and less painful ambulation, and it helps the ligament to heal at the proper length. These injuries, being more severe, usually take longer to fully recovery. Typically this takes about 6-12 weeks. Following these injuries, physical therapy is almost always needed. These injuries are by definition not isolated ligament injuries. They occur in conjunction with another ligament (ACL, PCL or multiple ligament) tear. There is often gross instability to the knee with looseness in multiple planes. Initially, a brace should be worn with this injury. Sometimes weight-bearing needs to be restricted for some time as well. Usually, the treatment required for the other ligament injuries, determines the definitive treatment. These injuries will require a much longer period of recovery. MCL sprains are common injuries. In this installment of the Two Boneheads video series, Dr. Howard Luks and I discuss the topics covered above in more detail. After watching, if you have further questions, please let me know.